Indoor flooding is a nightmare for property owners because it does not only affect a home’s infrastructure. Depending on the severity of the water damage, furniture, drywall, and electronics can all be affected. There are many different causes of indoor flooring, and they include broken or burst pipes, clogged drains, tropical storms, roof leaks, malfunctioning appliances that use water, runoff from melting snow, and more. Finding a quick solution for flood damage cleanup is vital to protecting your property and possessions from additional and long-lasting damage. Here are some of the most common causes of indoor flooding and how you can get professional home water damage restoration done quickly. 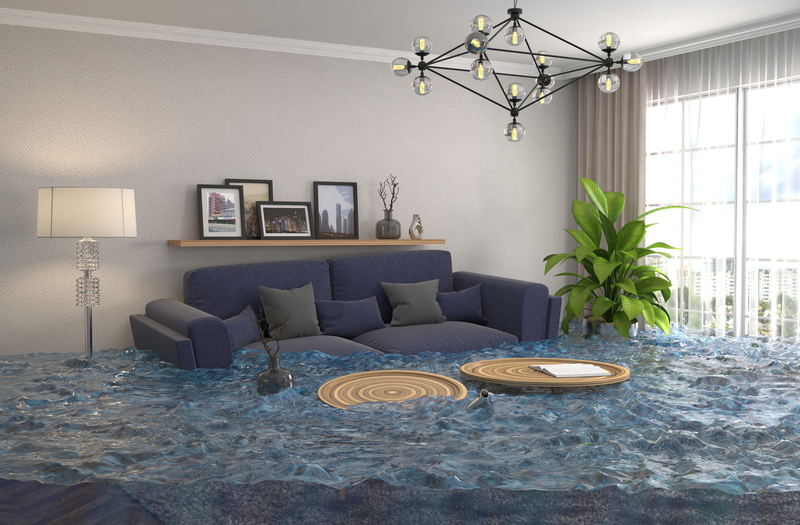 There are many different causes of indoor flooding, but you can inspect various places in your house to reduce the chances of this happening to you. In the event of water damage, there are professional companies that can handle the situation for you and ensure your home is safe to live in again. Here are the most common causes of indoor flooding. Heavy rain means water can seep into basement windows and other openings in your home’s surroundings. Be sure to check that windows are tightly shut during rainstorms, and that your home’s foundation is properly sealed. One common cause of indoor flooding is clogged drain pipes. Sometimes water and materials can get backed up in the drain pipes, and since the water no longer has a place to go, it can come back up and flood your house. Inspecting your pipes is a good precautionary measure. Inspecting your rain gutters is a great idea, especially during the winter and fall. If there are leaves or debris clogging the gutters, water can back up and overflow, drifting back into the ground around the foundation of your house. If you have any leaks in your basement walls, heavy rainfall mixed with the debris in your rain gutters can pose a flooding concern. A leaking water heater can also cause indoor flooding. These leaks, depending on how they are caused, can lead to major problems and the complete failure of your tank. If you see any signs of leaking from your water heater, you should inspect it immediately to prevent water from running into your house. If there is a partial clog in your sink drain, it can still cause problems even if there is a slow drain. For families that have small children in the house who run out of the bathroom without properly turning off the tap, this issue can be extremely pressing. If the sink fills to the top with water that eventually overflows to the floor, this water can travel throughout the rest of your house and leak into the cracks and spaces beneath. If your house is prone to flooding, consider installing a sump pump or have your house inspected and maintained regularly. A faulty washing machine hose can quickly burst and begin flooding your home. This is one of the reasons why washing machine flooding is one of the most common insurance claims filed by homeowners. You can prevent this from happening by switching your rubber hoses for braided hoses that are less likely to burst. You can also install a shutoff kit for your washing machine valve to avoid flooding issues. These tools can be a lifesaver for your flooring or the contents of your basement. Other washing machine issues may include pump problems or the overflowing of the inner tub. The most obvious cause of indoor flooding is a broken or leaky water pipe. These pipes burst because of changes in water pressure, rapid temperature changes, or faulty setup. Broken pipes can flood your home in minutes, requiring extensive water damage repairs. Leaky pipes are also a warning sign of future problems, and they will require a plumber to fix properly. Hidden floods caused by broken pipes in the walls or underground can encourage mould growth, which may cause further health issues for you and your loved ones. Repairing the damage caused by an indoor flood is a lot of work, and although there are professional services that can help you, it is always best to take precautionary measures to prevent a flood from happening in the first place. If you want to avoid an indoor flood, here are some water damage cleanup tips that you can follow. If you’re looking for water damage and cleanup in Brampton, there is a professional water damage restoration company that can help you in an instant. Expert water cleanup services will save you time and provide effective solutions to limit any additional damage to your home. They will also save you money in the long term because the job will be done right the first time. Flood Services Canada offers advanced, professional water damage repair and house flooding cleanup and will drain, dry, extract, and salvage as much as possible to minimize or eliminate any lasting damage. Contact us at (416) 302-2107 to learn more about our services, or reach us by calling (416) 999-3930 to get our rapid-response teams deployed to your location within one hour.